For the whole picture, click here (a high-resolution version can then be found by clicking the image at the top of the resulting page). Image credit: NASA/JPL-Caltech/MSSS. On November 26th 2011 NASA's Mars Science Laboratory (MSL) mission with its rover Curiosity was launched towards Mars. The main goal of the MSL mission is to determine the habitability of Mars, that is, to answer the question: Could the planet ever have supported microbial life? 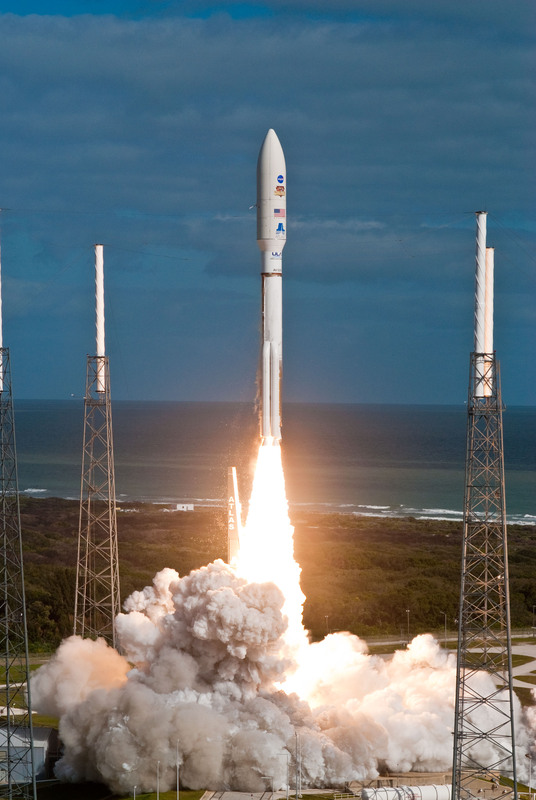 NASA's Mars Science Laboratory lifts off from Cape Canaveral Air Force Station. Click here for high-resolution version. Image Credit: NASA/JPL-Caltech. The answer is yes. Curiosity landed on August 5th 2012 in Gale crater on Mars and has since then shown that this location hosts environments which were habitable early in Mars' history. The Mars group has actively participated in experiments on the mission and published results, among other things about the discovery of ancient stream beds in Gale crater, analysis of soil from a typical dune and analysis of dust on the lander and on the surface. In 2011 a proposal from the Mars group regarding a series of experiments utilizing (almost all of) the science instruments on board was selected by NASA, and this was the basis of our participation in the mission. All the key chemical elements which constitute the ingredients for life: oxygen, carbon, hydrogen, as well as sulfur, nitrogen and phosphorus. The larger building blocks of life, the organic carbon molecules. It has also found that Mars had a thicker atmosphere and more water in the past, a result based on the current atmosphere's enrichment in the heavier isotopes of hydrogen, carbon and argon. Curiosity also discovered smooth and rounded pebble-like rocks, evidence of an ancient streambed that once carried flowing water about knee deep. The Mars group was directly involved in the analysis of clasts at Curiosity's landing site, an analysis showing that rivers once transported, grinded and rounded small rocks at this site. This work and its interpretation is illustrated by the small movie below by our team member Asmus Koefoed, who did a large part of the work. References and links to a selection of important articles published about the Mars Science Laboratory mission and its results can be found under Key papers. 1. Determine the nature and inventory of organic carbon compounds. 2. Inventory the chemical building blocks of life (carbon, hydrogen, nitrogen, oxygen, phosphorous, and sulfur). 3. Identify features that may represent the effects of biological processes. 4. Assess long (4-billion-year)-timescale atmospheric evolution processes. 5. Determine present state, distribution, and cycling of water and carbon dioxide. 6. Investigate the chemical, isotopic, and mineralogical composition of the Martian surface and near-surface geological materials. 7. Interpret the processes that have formed and modified rocks and soils. 8. Characterize the broad spectrum of surface radiation, including galactic cosmic radiation, solar proton events, and secondary neutrons. Several of the objectives, other than the biological ones, also address the question of whether life arose on Mars at some point in the past, since they try to shed light on the overall theme of the mission, the habitability of Mars. The geological investigations for instance, examine - among other things - whether the rocks and minerals could have been formed in water, the water being crucial for life as we know it. Click the image for NASA's official Curiosity page, or click here for higher resolutions of the image and details about it. Image Credit: NASA/JPL-Caltech/MSSS. Click the image for descriptions of the EDL phases, or click here for an animation of the EDL.